When you live in your RV full time, how do you get your mail? 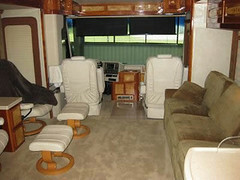 | Full Time RV Living + Working Online = Living the Life of Your Dreams! Home » Slideshow » When you live in your RV full time, how do you get your mail? Actually, this is probably the easiest issue to solve when you enjoy Full Time RV Living! The answer is — use a service! They are part of Passport America, an RV Club that allows you to get discounts at thousands of campgrounds around the country. This means you’ll need a Passport America membership in order to use the service. There’s just a $25 set up fee for the service. After that, you can choose to pay monthly, quarterly, or annually, with prices starting as low as $9/month. The service even has an online option. With this option, you can login to a secure area every day and see the envelops that you’ve received. You then choose how you want each one handled. You can choose to have the item discarded, held to send later, opened and read to you over the phone, sent to you immediately, etc. You pay for the shipments that are sent to you at the actual cost, but it’s really a bargain to never again have to receive junk mail! We receive our mail only about every 3 months as we have most of our bills set up on autopay or paperless billing (meaning we get emails for the bills). When we’re waiting for something important like a new credit card or debit card, we just give the service a call, tell them to keep an eye out for what we’re looking for, and to call us when they get it! When they call, we give them the address we’re located at and they send it via next day air! Can you imagine how much extra time you’ll have on your hands when you don’t have to get all that junk mail any more? We no longer get newspapers, magazines, or any other “garbage” via the mail! We get only the items we want and need, saving us hours of time every week and helping us cut down on the number of trees we cause to be destroyed every year. If you have any questions about gettimg mail on the road, just let us know! To Your Abundant RVing Success!